Albright, R., L. Caldeira, J. Hosfelt, L. Kwiatkowski, J. Maclaren, B. Mason, Y. Nebuchina, A. Ninokawa, J. Pongratz, K. Ricke, T. Rivlin, K. Schneider, M. Sesboüé, K. Shamberger, J. Silverman, K. Wolfe, K. Zhu, & K. Caldeira, 2016: Reversal of ocean acidification enhances net coral reef calcification. Nature, doi:10.1038/nature17155. Approximately one-quarter of the anthropogenic carbon dioxide released into the atmosphere each year is absorbed by the global oceans, causing measurable declines in surface ocean pH, carbonate ion concentration [CO3 2−], and saturation state of carbonate minerals (Ω). This process, referred to as ocean acidification, represents a major threat to marine ecosystems, in particular marine calcifiers such as oysters, crabs, and corals. Laboratory and field studies have shown that calcification rates of many organisms decrease with declining pH, [CO3 2−], and Ω. Coral reefs are widely regarded as one of the most vulnerable marine ecosystems to ocean acidification, in part because the very architecture of the ecosystem is reliant on carbonate-secreting organisms . Acidification-induced reductions in calcification are projected to shift coral reefs from a state of net accretion to one of net dissolution this century . While retrospective studies show large-scale declines in coral, and community, calcification over recent decades, determining the contribution of ocean acidification to these changes is difficult, if not impossible, owing to the confounding effects of other environmental factors such as temperature. Here we quantify the net calcification response of a coral reef flat to alkalinity enrichment, and show that, when ocean chemistry is restored closer to pre-industrial conditions, net community calcification increases. 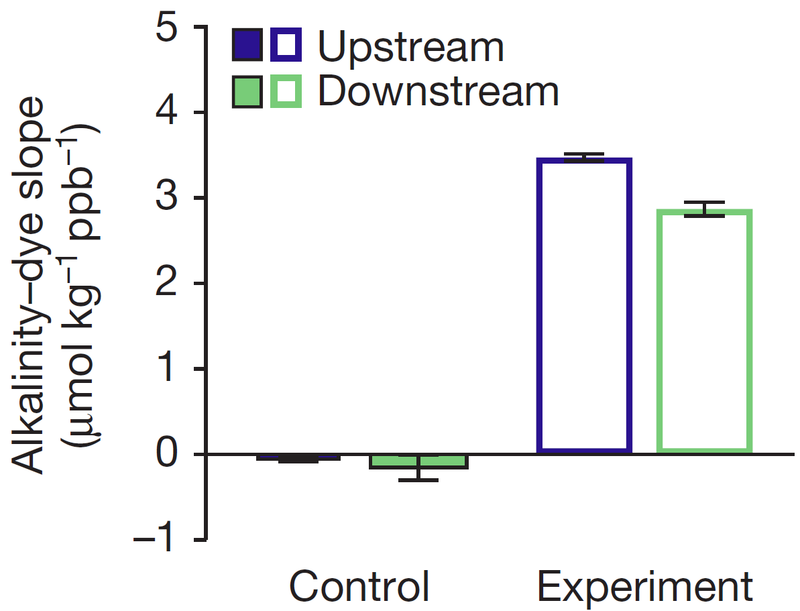 In providing results from the first seawater chemistry manipulation experiment of a natural coral reef community, we provide evidence that net community calcification is depressed compared with values expected for preindustrial conditions, indicating that ocean acidification may already be impairing coral reef growth. Figure 1. Study site and experimental design. (a) Australian map and aerial photograph of One Tree Reef with the study area denoted by an orange square. The map, sourced under Creative Commons CC0, is freely available for commercial use. Use of the photograph was permitted under an Educational license from the University of Sydney. 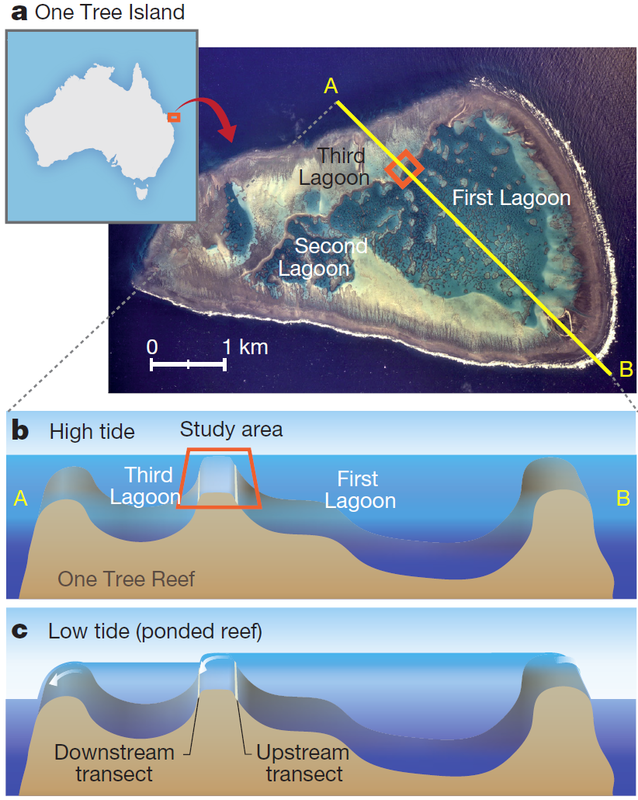 Cross-sections of the reef along the yellow line are shown for high (b) and low (c) tides, demonstrating the unidirectional flow from the upper lagoon (First Lagoon), over the reef flat study area, and into the lower lagoon (Third Lagoon) during low tide. Figure 1. Study site and experimental design. (d) Schematic of the study area (to scale) indicating the positioning of the transects and sampling locations. Figure 4. Alkalinity–dye slopes and percentage change in net calcification for control (N=7) and experiment (N=15) days (mean±1 s.e.m.). 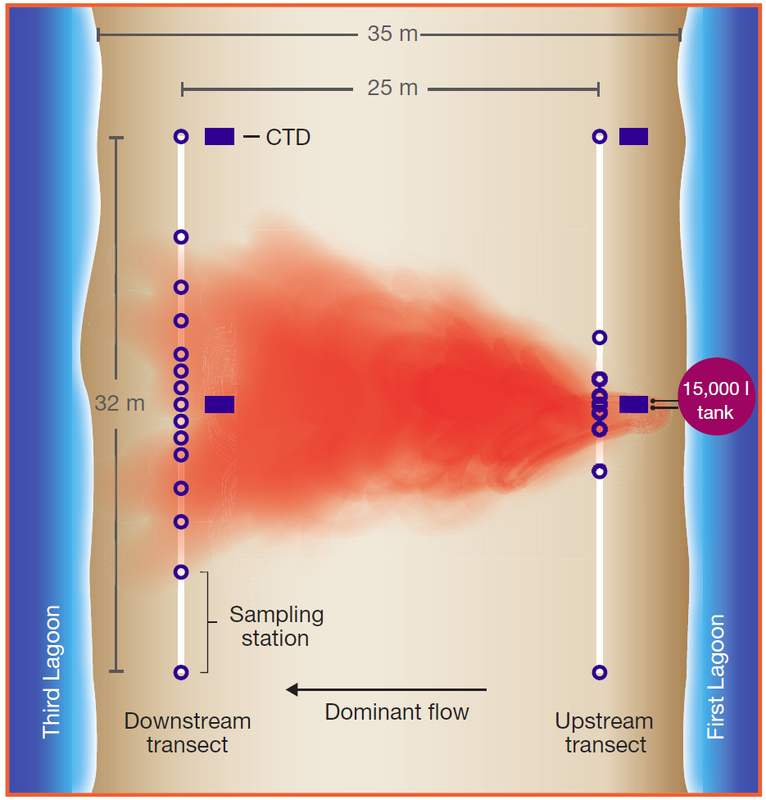 The difference between upstream and downstream slopes (a) was used to calculate the uptake of added alkalinity (equation (1) and the percentage change in net calcification (b) (equations (2)–(4)). The reef community took up an average of 17.3%±2.3% of the added alkalinity, implying a 6.9±0.9% increase in net calcification. 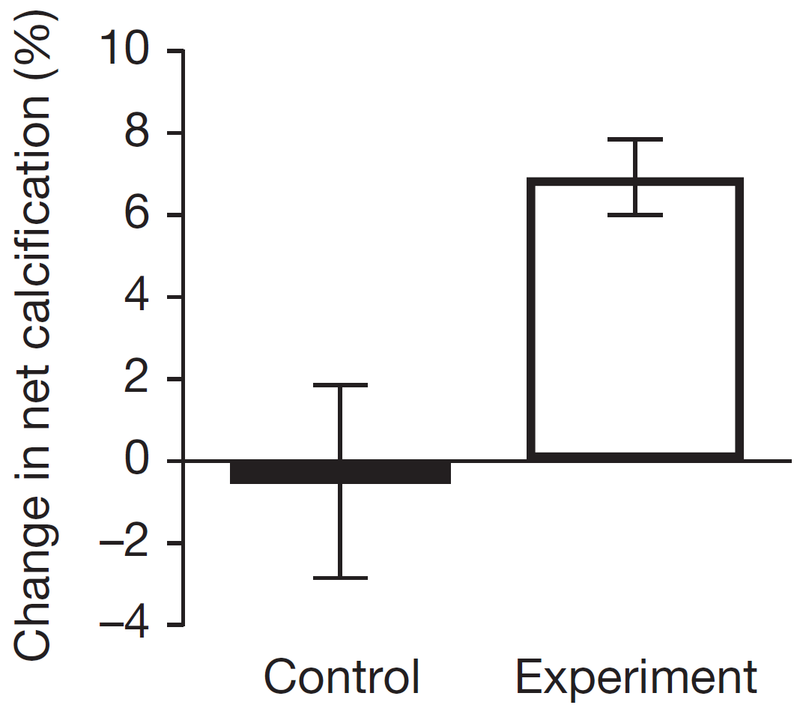 The percentage change in calcification on experiment days was significantly greater than control days (one-tailed, unpaired t-test, t20=1.981, P < 0.05). Results by day are presented in Extended Data Fig. 7.